VHC previously did this hike in January 2013, as part of a camping trip to Red Rock Cyn State Park. Unless folks want to make their own arrangements for camping at Ricardo Camp Ground, this is planned as a day hike following a drive in. We will begin our 9 mile loop by climbing to the top of the first of three ridges (which will account for most of the elevation gain and some easy scrambling) that allow great views of the Sierras to the north and the Gulch to the south. We will descend from the third ridge, and enter the east end of the gulch for an easy mostly level hike enjoying spectacular rock formations all around us until we emerge from the west end and return back to the trailhead. 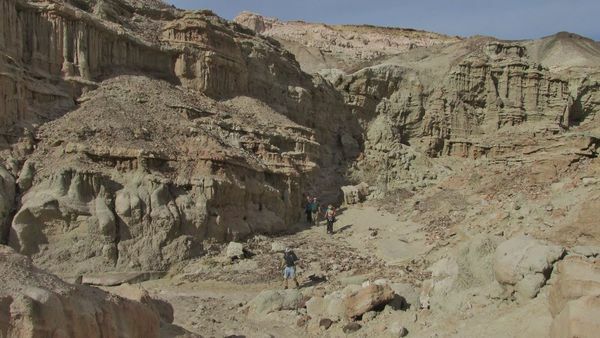 Nightmare Gulch is a small, colorful, highly scenic canyon. The area attracts many birds of prey. To protect the raptor nesting sites, this area of the park is closed to hikers and vehicle travel yearly from February 1 to July 1. The gulch has many side slot canyons just waiting to explore. Along the way, we will turn into one to view a specific rock formation called Magic City. Historically, the area was once home to the Kawaiisu Indians, who left petroglyph’s in the El Paso mountains and other evidence of their inhabitation. The spectacular gash situated at the western edge of the El Paso mountain range was on the Native American trade route for thousands of years. During the early 1870s, the colorful rock formations in the park served as landmarks for 20-mule team freight wagons that stopped for water. About 1850, it was used by the footsore survivors of the famous Death Valley trek including members of the Arcane and Bennett families along with some of the Illinois Jayhawkers. The park now protects significant paleontology sites and the remains of 1890s-era mining operations, and has been the site for a number of movies. The beauty of the desert, combined with the geologic features make this park a camper’s favorite destination. Wildlife you may encounter includes roadrunners, hawks, lizards, mice and squirrels. Dogs must remain on a 6-foot maximum leash and be accompanied by a person at all times. Dogs are not allowed on established trails, however, as we will not be following an actual trail, they are okay for this hike. They must be cleaned up after and cannot be left unattended. 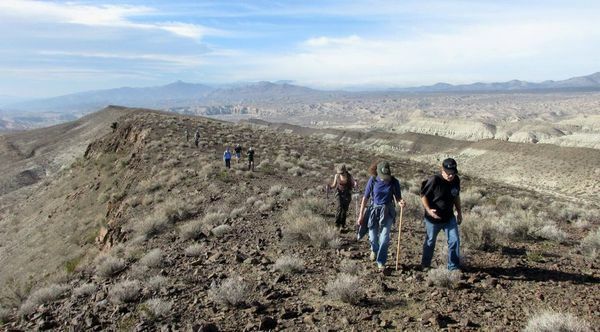 Bring a lunch, snacks, and adequate water for a desert hike. It will likely be very cold and windy in the morning, so dress WARMLY, but in layers that can be removed as the day goes on. The park is 25 miles northeast of Mojave on Highway 14, near Cantil. From Highway 14, there is a clearly signed turnoff to Abbott Drive where the Ricardo Campground is located. 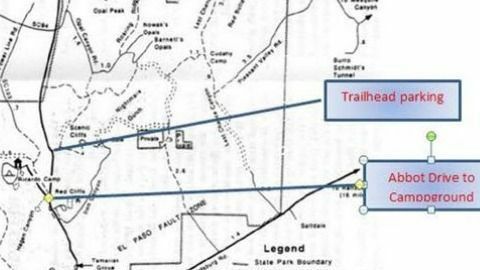 We will meet at the trailhead, which is a dirt turnout apx ¾ of a mile north of the Abbott Drive turnoff on the right hand side. It is the only obvious pull out for parking from Highway 14. While not clearly marked it should be somewhat obvious. The park is 120 miles north of Los Angeles, via Interstate 5 and Highway 14. Folks who would like to carpool can meet at the Starbuck’s restaurant parking lot at 16548 Soledad Canyon Road, Santa Clarita, CA 91387, off of the Sand Cyn exit on Highway 14 in Santa Clarita. Meet at the carpool location by 7:00 AM for 7:15AM departure. The carpoolers will stop for a final bathroom break at the Carl’s Jr in Mojave. 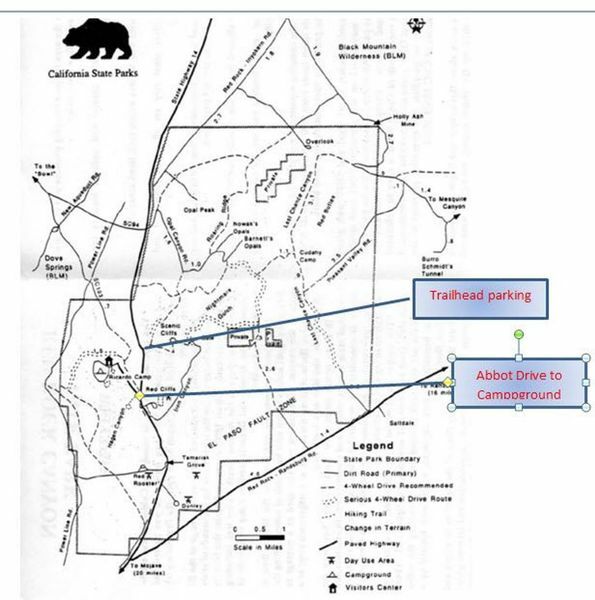 Anyone driving directly to the trailhead should plan to meet there at 9:00 AM, however carpooling is encouraged as there is limited parking at the trailhead.